A few months back, I had a bad spark plug wire on the 03. They were the 7mm Beldens for series 2. My 93 had 8mm Beldens for series 1 that were put on just before I wrecked it. Rather than getting a new set of 7mm's, I grabbed the front three 8mm ones (rear ones were smashed against firewall). It ran fine so didn't think anything of it. Lately, it had been gradually losing power and missing like another wire was going bad. It was also getting radio interference as a tick at frequency correponding to once per revolution. I pulled the plugs and found this. Electrodes on the front 3 pretty much disappeared in 2 or 3k miles. I put new plugs & wires on it and it ran great but radio noise was still there. I swapped a good coil in each position one at a time and confirmed the noise as a bad coil. I didn't think there would be that much difference between the performance of the two styles of wires. I thought the difference was mainly in the insulation thickness. I also have never had a coil run fine but still make noise like that either. Well, my thoughts are that one set had a lot less resistance than the others, so more current flowed through them, and blasted the electrodes. 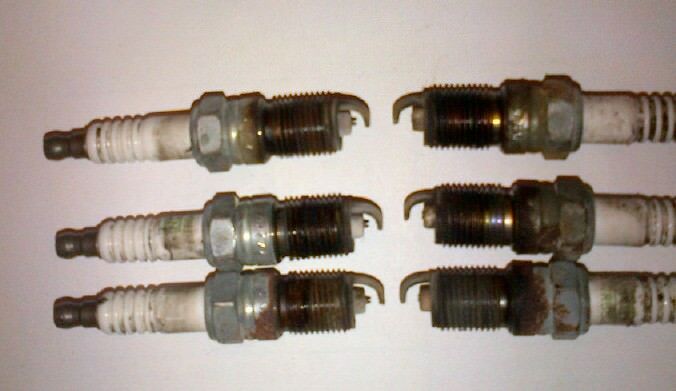 What spark plugs are these? I know the ignition setup on these cars will trash platinum plugs, especially in the supercharged application. In modern conditions, this method has a very small impact on the length on the service intervals of the vehicle and the longevity of individual components. Modern ignition systems do not have breaker points, which have been almost entirely replaced by electronic systems. Modern ignition coils outlast most other components of the vehicle and modern spark plugs have excellent service life, though there is a slight-difference between the two plugs as to erosion suffered at the center electrode. Because the spark jumps in opposite directions on the companion plugs, one bank will erode the center electrode more, and the opposite bank will erode the ground electrode more. Spark plugs used in wasted spark systems really should have precious metals, such as platinum and/or iridium, on both the central and ground electrodes in order to increase the average service interval time before replacement is needed." Interesting. I've never noticed the effects on the plugs. Back in the early 90's with my 92 L27, I didn't believe the 100k mile claim in the manual. I ran the original platinums to see how long they would last. They survived to 100k and were beyond done at 150k. On my '00 and'03 L67s, I ran original platinums to 120~125k. On both, I replaced the original Platinums with Iridium. The '00 lasted 175k and the '03 lasted 120K. I usually re-gap plugs every 50~75k miles. Sometimes only 1 or 2 need adjustment. The ones above are NGK TR55GP platinum with around 60k miles. The 8mm wires were on for 2~3k best guess, definately under 5k worst case.